Claire will be here in a few hours! Her mom and dad are ripping out old carpet today and new carpet will be laid tomorrow, and since tacking and 2 1/2-year-old feet are not compatible, Claire will spend a few days with Grammy Lynn. I thought since I will be disposed for a few days, I’d post an essay I wrote in December 2006. 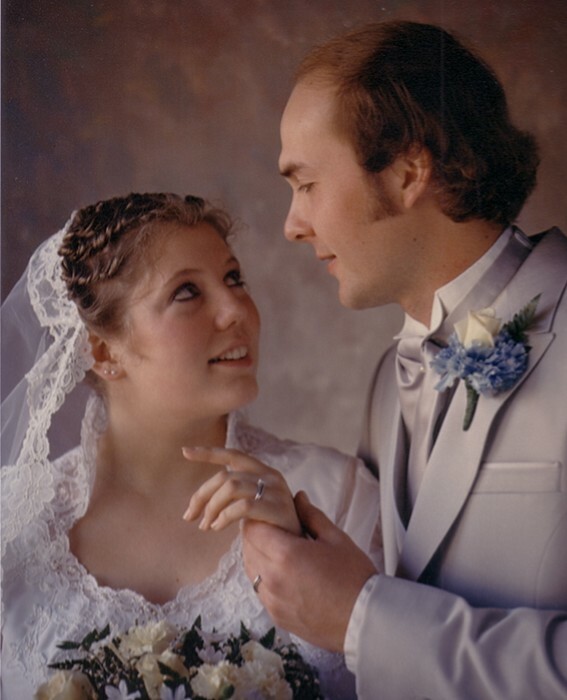 Saturday would be my 28th wedding anniversary, and thankfully April 3 will end another year of anniversaries. All the more reason to love spring. I forget his face sometimes. I try really hard and shut my eyes tight and I can sense his body, but I can’t see his face. I guess it’s because I never thought to remember those everyday moments of seeing someone I thought would be there forever. I know I looked in Bruce’s eyes at our wedding when we said our vows. I know I was holding his hands. I know I kissed him at the reception every time someone clinked their glasses. But I don’t remember looking into his eyes. 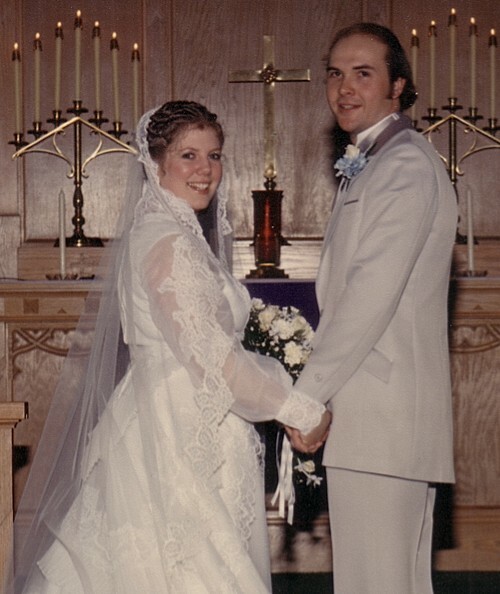 I remember stopping at the bowling alley on our way to the Holiday Inn in Sioux Falls and eating hamburgers while still dressed in our wedding clothes. I remember taking the dozens of hair pins out of my hair that night and him laughing at the sticking up curly mess they left. I know we made love, but I can’t see his face. I know Bruce’s eyes when I see them in photographs. They were soft and brown like a puppy’s, but because I can’t see them in my mind’s eye, I fear we never were. Did Bruce really exist or did his death take our history? Our daughter is real and her eyes look like his, but when I look at her I see Carlene, not Bruce. Then, on a dark, gray, rainy morning more than 23 years later, listening to Roberta Flack sing “The First Time Ever I Saw Your Face,” a small detail emerged. It unfolded in my mind like a delicate piece of paper. The detail was so small, and yet I burst into tears in the parking lot of the gym – happy it was there and so sad that he wasn’t. I remembered the softness of the hair on his chest. What happened next was a cascade of remembering. One thought created a flood of memories I never wanted to forget again, and so I wrote them down on deposit slips from my checkbook because I had no paper with me. I remembered how we’d lay on our bed and talk for hours listening to music with just the light from the stereo shining on us. I loved to touch his hair lightly and run my fingers across his muscles while my head rested just below his shoulder. I remembered the feeling of missing him when he was away at work, the thrill of hearing his truck pull into the drive, holding his hand while we drove, watching him drum the steering wheel to “Juke Box Hero” while driving our red Citation. I remembered watching him feed cows and vaccinate pigs and sitting with him in the tractor in the pitch dark waiting for his brother to return from combining beans. We sang “Endless Love” at the top of our lungs – he singing Diana Ross’s part and me Lionel Ritchie’s. I remembered taking off my shirt one Sunday afternoon in spring as we walked through the pasture and the freedom of making love to him in the sunshine. I remembered the night a few days before Carlene was born when I was watching TV alone and suddenly went cold inside. I had a feeling Bruce was dead. He was bowling (it was league night) and I called the bowling alley. They got him on the phone and I said, “I know this sounds stupid, but would you come home?” Five minutes later I heard a train whistle. I started crying, convinced he’d not heard it. A few minutes later, his headlights shined on our garage. I greeted him at the door, bawling, and he laughed lightly and reassured me he was fine. We blamed it on hormones and sat on the couch and watched the last episode of MASH. Two weeks later, he was killed by a train. Sometimes I think I’ve clogged my life with so much busyness that I don’t know which moments are truly important enough to remember. Thank god Roberta Flack and her bittersweet song helped me remember that long ago there was a boy who made me feel unlike anyone ever has, and that he had soft hair on his chest. This entry was posted in Uncategorized on March 30, 2010 by Lynn Haraldson. What beautiful memories. It made me cry. Thanks for sharing. So beautiful… thinking of you. Very beautiful – brought tears to my eyes. This was the most amazing post I have ever read. It brought tears to my eyes and then running down my face. Thank you so much for sharing this with me. It made me call my hubby just to hear his voice.. This is truly one of the most beautiful, gentle things I have ever read. Awww. What a love story. What a couple of sweet young kids. And what a tragic ending. I'm so glad you found your memories and have the courage to share them. Hugs to you, my friend. Love you and thinking of you. A beautiful post. Thank you for writing. I LOVE roberta flack I sang with her in KY at a festival! That was beautiful. I had to stop twice and go back so I didn't break down completely. It was worth savoring. Thank you so much for such a moving post….I will celebrate 34 years in May and I will never look at my husband the same since I read your post..Thank you so much and may you be lifted up! God is good! It truly was lovely. You wrote it very well. What I kept thinking wasn't 'sadness' – it was happiness that you were able to love someone THAT much. And how glad I was that you had your daughter by him. (I think there is a movie in there – have you ever tried writing a screen play?). Yep, shed a tear on this one! Beautiful post and I am so sorry for your loss, however long ago it was. I've been married almost 10 years and I still get butterflies in my stomach when my husband pulls in the drive – thank you for this post – I'll give my hubby extra kisses tonight! Thank you for sharing this… it was so beautiful, and touched me deeply. Lynn, As I read the tears streamed down my face. My thoughts are with you. I find it ironic how death teaches so much about life, and how the grief wells at such unexpected times. I had to also chuckle at the thought of writing on deposit slips. I found my checkbook empty more times than I care to admit as the same result. I think there is something about the stillness of being in a car that pushes the feelings to the surface that we spend so much time trying to keep a lid on. I, too, had a premonition/vision/thought about our twins dying just a couple weeks before it actually happened. My husband thought I was a raving lunatic. That is also such an altered state. Thanks for sharing such a tender moment. Take good care. I wish I was there to give you a hug…. Thank you, everyone, for such kind thoughts. I'm glad a few of you have the opportunity to hug up your significant others a bit after reading this, too. Happy anniversary to you and your husband, PilbaraPink 🙂 I love that we have that date in common. Lori, posting a hug is almost like a hug. Thank you, my friend. lottsa love flowing from Austin. I've been following you silently for some time now but must say your post hit home. It will be 14yrs since my husband died suddenly and my daughter was two. You let me reach for those memories I sometimes put in storage. Thank you for sharing.